An early Christmas present: Comic Book Resources has a sizable preview online for Star Wars: Knights of the Old Republic - War #1! 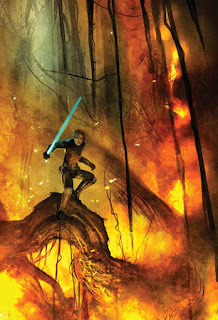 There are a whole bunch of interviews coming up, so I won't say too much more beyond what's here -- except to note that we have a great jumping-on point here for readers, as Zayne Carrick is thrown into the Mandalorian Wars as a draftee. Star Wars: Knights of the Old Republic - War #1 ships January 11. Order it now from your local retailer or TFAW! Knight Errant Deluge finale and Mass Effect Invasion #3 now on sale! On a holiday shopping run tomorrow? It's another double comic day for me — with the final issue of the latest Kerra Holt adventure, Star Wars: Knight Errant - Deluge #5, hitting stands, alongside Mass Effect: Invasion #3! 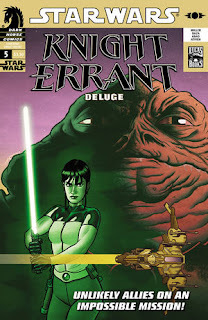 "In Knight Errant - Deluge #5, caught between a Sith and a Hutt, Jedi Knight Kerra Holt must battle both to save the billions on the planet Darkknell from being drowned by a fleet of ships with the power to flood the planet! Her plan is full-steam-ahead brute force--but her enemies are more cunning than she expected. Is this the end of Kerra Holt, the lone Jedi? 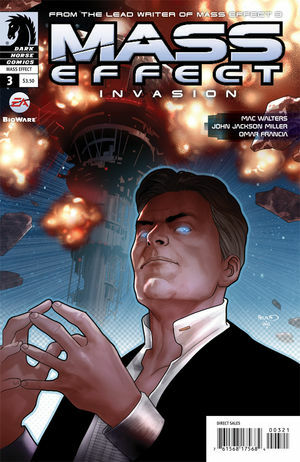 "In Mass Effect: Invasion #3, the Omega space station has fallen and Aria, Omega's pirate queen, is on the run from an enemy greater than anything she's ever faced before. Learning that the battle is merely the first skirmish in a war that will reshape the galaxy, Aria must retake Omega and lead a new charge to save her empire!" With two variant covers — one by Paul Renaud, and the other by Massimo Carnevale! Thanks, catalog! Hopefully the holidays will give me a chance to get caught up on some production notes for the site. In the meantime, have a comic Christmas! Just as the headline says: There's a meaty interview about next month's new Star Wars: Knights of the Old Republic - War series up today over at Newsarama. Check it out! 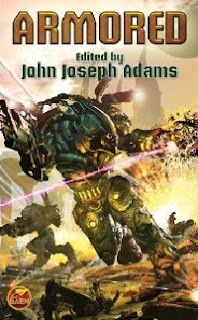 Editor John Joseph Adams has just posted the line-up for Baen Books' Armored anthology that I've got a story in — it's due out March 27. In addition to familiar names like Jack Campbell, Dan Abnett, and Alastair Reynolds, the mass-market paperback has stories from some fellow Star Wars authors, Michael Stackpole and Sean Williams. I've just posted a page on the site for the book here. Armored is a collection of stories about futuristic armor-wearing characters. It's familiar territory after my past Crimson Dynamo, Iron Man, and Mandalorian work — and my own story, "Human Error," represents my first original fiction in a long while, including a brand new SF milieu. You can preorder Armored from Amazon here. Mike, whose column I edited for years at Comics & Games Retailer, will be the author guest of honor at one of my annual haunts, Midsouthcon in Memphis March 23-25. Hopefully we'll be able to get copies in time for the show. In the meantime, I've also added some more updated pages to the site, including a page for the Mass Effect: Invasion collection, which is due out in April and can also be preordered now from Amazon. Also, Dark Horse has gone same-day for download purchases of digital comics: read about it here.